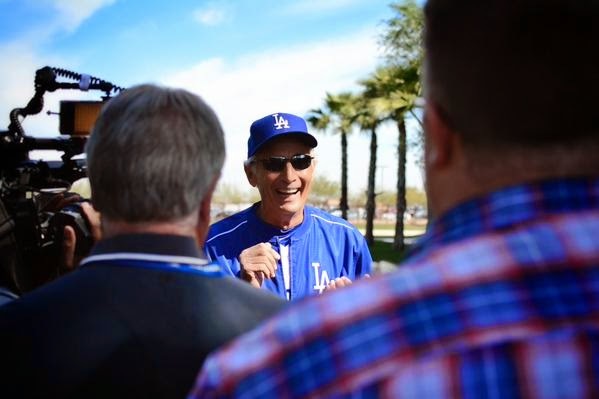 LET’S GET IT STARTED: Today marked the first full-squad workout of the 2015 season and Dodger Manager Don Mattingly introduced key personnel including Hall of Famers Sandy Koufax and Tommy Lasorda and Dodger Legends Maury Wills and Manny Mota to the team. President of Baseball Operations Andrew Friedman, Director of Public Relations Joe Jareck, Director of Team Travel Scott Akasaki and Vice President of Medical Services Stan Conte also addressed the team. Former Dodger first baseman Eric Karros arrived in Camelback Ranch today and will be a special instructor for the team for a couple days. NICE TO MEET YOU: With the full-squad in full gear today, the Dodgers’ 40-man roster is filled with new faces which includes 19 new players since the end of the 2014 season. Joc Pederson, Carlos Frias, Zach Lee and Chris Reed, who were non-roster invitees last year are making their first appearance to Spring Training. 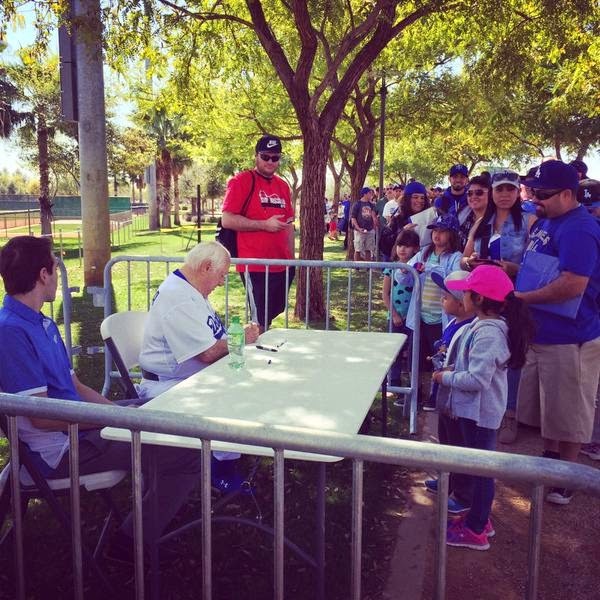 BUSY WEEKEND: On Saturday morning, the Dodgers will have their Photo Day at 7 a.m. and media outlets who are scheduled to attend are Dodgers photographers, MLB Photos, MLB.com, ESPN the Magazine, Topps, LA Times, USA Today, Getty Images, Baseball Digest and Associated Press. 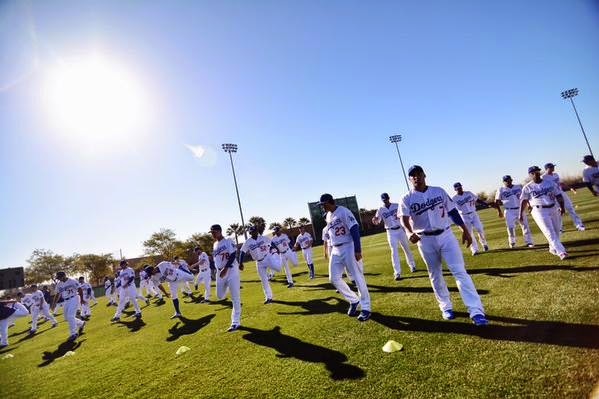 On Sunday, the Dodgers will be featured on ESPN SportsCenter, which will air live from Camelback Ranch – Glendale. BACKSTAGE: DODGERS: SportsNet LA will debut a new season of its signature series, “Backstage: Dodgers,” tonight at 7:00 p.m. The behind-the-scenes documentary series returns with new exclusive inside access to the team that will cover the off-season to the first day of Spring Training and through the last pitch of the season. “Backstage: Dodgers” episodes will debut every Thursday all season and will provide fans with an unrivaled behind-the-scenes view of the players, coaches, executives and Dodger legends inside the clubhouse, out in the community and more. BLUE DIAMOND GALA: The Los Angeles Dodgers Foundation (LADF) announced today its inaugural Blue Diamond Gala honoring the Jackie Robinson Foundation, The Los Angeles Fund for Public Education and the LA84 Foundation on Thursday, April 16 at Dodger Stadium. The event will kick off with a VIP reception hosted by Dodger owner Earvin “Magic” Johnson at the Top of the Park, a cocktail reception in center field, dinner and awards with a Ted Baker London fashion show featuring Dodger players. There will also be a performance by Grammy nominated singer/songwriter Aloe Blacc. For tickets and information on Blue Diamond Gala sponsorships please visit www.dodgers.com/gala.